August 1993 and the UK saw a new type of gaming magazine. Edge was a serious look at the gaming industry and focussed on technology, the studios and in depth stories on the development of games themselves. I loved it and have blogged about Edge a few times over the years. I’m still a subscriber and enjoy getting a physical copy each month. It’s read cover to cover and joins the full collection of Edge magazines that I’ve been close to ditching a couple of times but glad I held on to them even if the shelves storing them collapsed recently. They do weigh quite a bit. Edge launched at a key time. The first PlayStation came out a year after launch in 1994 and a few years later saw the launch of the PS2, Gamecube and the first Xbox. It was a golden age with lots of hardware and game studio changes and Edge was often the first to break stories, have exclusive game previews and conduct interviews with developers that no one else could get. The internet quickly changed the magazine market but Edge has survived mainly thanks to it’s original content. In the past I’d decide game purchases based on Edge reviews but not anymore. Games are often out for 4 or 5 weeks before a review will drop through the post. They are still a great read and the rare Edge 10’s still something to covet but they don’t make or break a game anymore. Looking back at issue 1 feels like ancient history – they had 2 pages dedicated to format charts and Syndicate was number 1. Rise of the Robots was previewed, just one of the many games that looked amazing but was actually terrible. Issue 3 was previewing VR which took some 23 years to land in anger – you can’t say Edge wasn’t ahead of it’s time. It was also when import games were king and paying £80 – £120 for a game wasn’t unheard of as it would take 6-9 months to land in the UK. One last noteworthy aspect about Edge is the covers. Some of them have been amazing featuring exclusive art, use of different finishes and in pre-internet days and sometimes still today would reveal a new piece of hardware or preview of a game. Don’t get me wrong, some of them have been awful but they give a great visual history of the last 25 years of gaming. Click on the image to the right to see all 323 covers or visit my Edge Magazine Covers Flickr album to see them in detail. Hard to believe that 25 years have passed since that first issue. I’ll also confess that I didn’t buy the first one and had to order a back issue after a few months. So glad I did! It seems unlikely with the pace of change, but here’s to another 25 years of the worlds best gaming magazine. 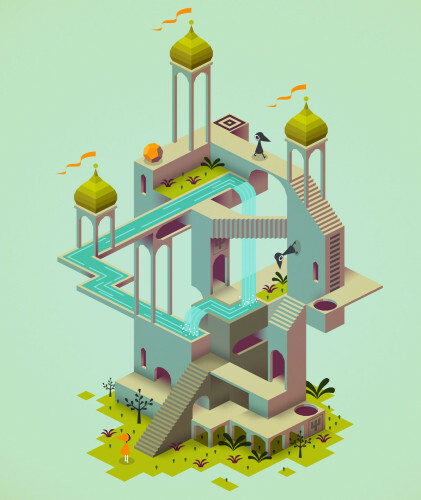 It’s not like iOS gaming needs another endless runner but if it looks and plays well who can complain? It costs £1.49 and is very addictive and although I thought it was quite shallow there is a lot of subtle tricks and techniques to learn. You can find out more at the Alto’s Adventure website. F-Zero and Wipeout are two of my favourite games of all times. AG drive gets pretty close to the feel of each of them but with no weapons. It’s fast paced and looks really good on the iPhone…not so sure on the music though. Lots of tracks, customisable ships and some good challenges as you start to rank up. £2.99 and it could be yours. I’d love a second version that had weapons and allowed custom soundtracks…or maybe a future update? What’s nice is that both games are ad free and have no in-app purchasing. How refreshing. 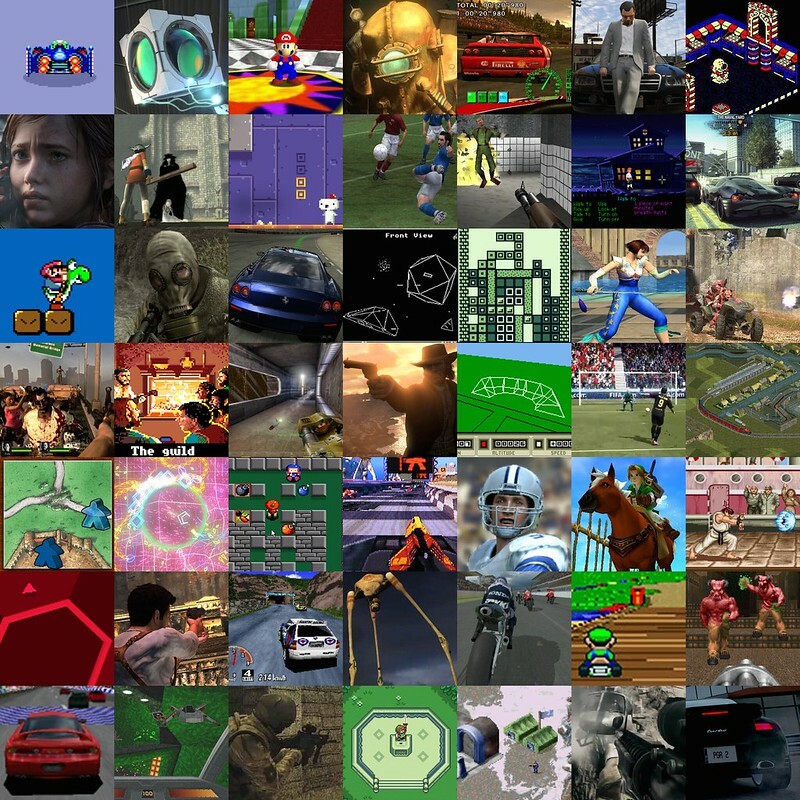 Back in 2005 I posted my bestest games (horrible title) from the last 20 years. A couple of months back I felt it was due a refresh so here are my bestest games from the last 30 years. Flickr have stopped supporting their hover notes so instead the list is below. A few iOS games have crept onto the list as well as some 360 and PS3 updates but some classics have never really been bettered. F-Zero – 1991 SNES – An almost perfect futuristic racing game. Time trialling was a real challenge. Wasted far too long trying to shave a few hundredths of lap times. Future F-Zero’s never recaptured the magic. Portal 2 – 2011 – Xbox 360 – Follow up to Portal this was a great first person puzzle game that had a batch of single and co-op puzzles as you battled against GLaDOS. Super Mario 64 – 1996- N64 – Never been bettered. Still enjoy firing up the emulator and tackling another couple of levels as it’s such a fun game. Bioshock – 2007 – Xbox 360 – A first person shooter with an original story, stylish graphics and a way of getting in your head like no other. Loved it. Ferrari F355 Challenge – 2000 – Dreamcast – One of the hardest console racers, not just of it’s time, but across the various consoles I’ve played. Looked great at the time but it’s sobering to think how 1 car and 10 tracks were enough to satisfy everyone. Now we want double the tracks and hundreds of cars. GTA V – 2013 – Xbox 360 – Latest in the series and by far the best. Play as one of three characters, take part in heists and a truly massive world to roam around complete with multiplayer. It looks better than it should have on a 360 and I’ll probably pick up for the PS4 when it get’s re-released this year. Head Over Heels – 1987 – Amstrad CPC 464 – A cracking isometric game that I played to death. Graphics were groundbreaking at the time and it was pretty humorous too with a great soundtrack and effects. The Last Of Us – 2014 – PS4 – Action and survival game with a great story, graphics and music. Best game on PS3 and looks amazing remastered on the PS4. Ico – 2011 – PlayStation 3 – I ignored this title on the PS2 finally picking it up on the PS3. Puzzle/platformer with each room viewed from a fixed point but a camera that focuses on your character. One of those games that doesn’t appear to offer much but leaves an impression that is hard to forget. Fez – 2012 – Xbox 360 – A puzzle platformer that looks more at home on a SNES than current consoles and relies less on pixel perfecting jumping than puzzle solving at a more relaxed pace. A classic. Pro Evolution Soccer 3 – 2003 – PlayStation 2 – The best football game on a console. Local multiplayer only but it was the game of choice at the time for football fans and it was fantastic. Later versions added online but it was awful…and Fifa eventually took Pro Evo’s crown as it beefed up on gameplay and in particularly won online. Goldeneye 007 – 1997 – N64 – For me still Rare’s best game. Perfect Dark was good but always enjoyed Goldeneye more, maybe because it was first. The Secret of Monkey Island – 1991 – PC – Still my favourite Lucasarts game. It was funny, captivating and great to look at. The music was also memorable. Burnout Paradise – 2009 – Xbox 360 – Best of the Burnout series and the best open world racing game so far. Developed by Criterion it featured great challenges, a memorable soundtrack and an online party system that worked really well. Super Mario World – 1990 – SNES – My first SNES game and probably the one I played the most (behind any multi player). The level design was perfect, so many shortcuts in the game – you really could play it any way you want. When it was complete there were still coin challenges to do. A masterpiece. Call of Duty 4: Modern Warfare – 2007 – Xbox 360 – The best Call of Duty multiplayer for me. Great maps and some innovation with games modes made it really enjoyable. Later versions just never captured me the same way that Modern Warfare managed. Forza 2 – 2007 – Xbox 360 – This was such a complete racing game. Lots of tracks and car’s so if you liked to race you were well catered for. Add to that a detailed tuning and setup option for each car which were a tinkerers delight. Finally a skinning engine that allowed for 1000 layers of graphics so artists could spend there time in that part of the game. With a marketplace to buy and sell setups and skins I had a friend who never raced but spent all his time creating amazing skins for cars….and made far more money than I ever did racing. Elite – 1985 – Amstrad CPC 464 – Space trading epic. Almost 30 years since I played this and I can still remember what a pig it was to dock all while the Blue Danube played in the background. Just bought Elite Dangerous which will hopefully recapture the magic. Tetris – 1985 – Gameboy – Has any other game sold a platform more then Tetris? The Gameboy was an essential purchase just to play this. Multiplayer at school with this (using cable to connect two machines) was amazing. SoulCalibur – 1999 – Dreamcast – The reason I bought a Dreamcast. It’s graphics remained untouched for a couple of years, it’s fight mechanics were great and it had a lot of depth for a beat em up. Halo 3 – 2007 – Xbox 360 – I love all of the Halo games but this stands out the most. First Halo release on the 360 and the graphics were great. Bungie also addressed the de-ranking issues that had plagued Halo 2, the multiplayer was deep and well supported with lots of downloadable content and it also coined the phrase ‘get out’. Probably my most played online game. Left 4 Dead 2 – 2009 – Xbox 360 – A co-op first person shooter that was one of the first to really emphasise co-op so much so that you needed friends to get you through levels and there was a great feeling if you did manage to complete a level. The amount of enemies thrown at you was mental and every so often you’d hear one of your buddies shout ‘Tank!! !’ or ‘I’ve woken the witch……run!!!!!!’. The Bards Tale – 1985 – Amstrad CPC 464 – Simple graphics but more of a text adventure, and the first role playing game I ever played – weird – I’ve hardly played one since although I completed this at the time and loved it for weeks. Unreal Tournament – 1999 – PC – Came out at the same time as Quake III Arena and spanked it’s arse. The first FPS I played online and it’s something I’ll never forget. So fast, so addictive and the follow ups just never clicked for me as much as this. Red Dead Redemption – 2010 – Xbox 360 – GTA set in the wild west, Red Dead Redemption was so much more. Lots of sub games, a great story and horses. Sunsets. Zombies! Mercenary – 1985 – Amstrad CPC 464 – I played this on the Amstrad. Graphics are awful when you look at them but the plot and adventure was great and the sense of achievement when escaping the planet was massive. The overview map is fantastic and shows you the scale of the game which was ambitious for it’s day. Fifa 12 – Xbox 360 – 2011 – Fifa has become the best football game on consoles and I could have picked almost any year, but Fifa 12 saw a big step forward in online play and the mechanics were refined more than any other yearly release too. Importantly, the online actually worked too unlike some other years which have been buggy upon release and sometimes taken 3-4 weeks to resolve. Transport Tycoon – 1994 – PC – Another Uni favourite and was a massive time sink. Loved it. Carcassonne – 2010 – iOS – A slick single or multiplayer iOS game based on the German board game. I’ve been playing this for 4 years and it’s still compelling especially with the droop feed of add-on’s released by the games developers, The Coding Monkeys. Geometry Wars: Retro Evolved 2 – 2008 – Xbox 360 – Geometry Wars was a small game available in PGR2. A year later and this full title was released. 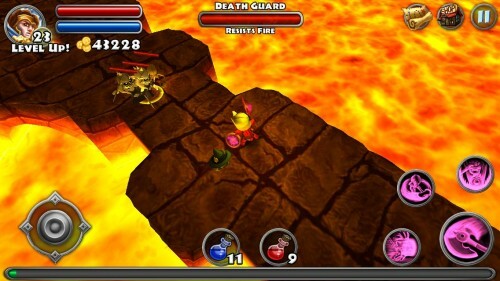 It’s a shooter which is fast paced and the screen gets very, very busy as enemies and explosions fill the screen. Super Bomberman 2 – 1994 – SNES – Golden Bomber. I knew when to stop the roulette wheel…allegedly. If theres one game where I would expect to win before I start, this is it (and Pro Evo). Still love it to this day. Wasted sooooo many hours at Uni playing this. David and his speedy boots. Those were the days. Wip3out – 2000 – PlayStation – The whole Wipeout series was great but the third edition was the best on the PlayStation. Where is Wipeout for the PS4? Madden NFL 10 – 2009 – Xbox 360 – I’ve played Madden for years from early version on the SNES right through to current consoles. Madden 10 stands out as they made a number of improvements to gameplay which has been incrementally improved since. I’m also convinced that I played this version more than previous/future versions. A great game and very deep if you give it time. Legend of Zelda: Ocarina of Time – 1998 – N64 – Fantastic design, massive play area and it was great to play Zelda in a 3D environment. Street Fighter II – 1992 – SNES – I loved it. So did Shakeel. Unfortunately for me I hardly ever won on this game – still kept coming back for more and might have thrown the odd pad or two. Super Hexagon – 2012 – iOS – A twitch game that consumed many hours on the iPhone. Simple graphics and seemingly impossible at first but then you get better, figure out patterns, and it gets faster and faster and faster. A classic. Uncharted 2 : Among Thieves – 2009 – PS3 – Stunning adventure game that looked and played great. Preferred this to Uncharted 3. Sega Rally Championship – 1995 – Sega Saturn – A great game that saw some mighty local multiplayer games between me and Shak. Had much better feel than Daytona which was another Saturn classic. Half Life 2 – 2004 – PC – A game to upgrade your PC for. I loved this more than the original. The set peices were far more involving, the use of physics blew me away. 10 years on and we still await Half Life 3. Moto GP – 2002 – Xbox – Originally a demo for Xbox Live beta testers, Moto GP was a great showcase for Live. League racing and friendships made that are still there today. This took me back to F-Zero days – time trialling has never been so addictive and frustrating. Mugelllooooooo. Super Mario Kart – 1992 – SNES – So simple yet deep. So easy yet hard. So much fun. None of the follow up’s captured the feeling from this title nor the fun. Doom – 1993 – PC – My first FPS and it was such a step forward from what had come before. Gran Turismo – 1998 – PlayStation – First of the series and arguably the best as the others that followed have added very few new idea’s. In it’s day nothing could touch it and it ate up so much time. Descent – 1995 – PC – First true 3D game. Never has flying through passageways been such good fun. Played this so much at Uni. DESCENT!!! Ghost Recon Advanced Warfighter – 2006 – Xbox 360 – A first person shooter but this was far more slow paced and tactical. No game could offer gameplay like this – 8 mins of crawling around in bushes to then get shot and killed…or tens mins of sitting in a shed waiting for an attack. Online chat was legendary during this game but our group loved it. Blind siege was our online mode of choice. Legend of Zelda: A Link To The Past – 1991 – SNES – One of the few console games that I’ve played through to a finish. Got the puzzle/arcade balance absolutely spot on and kept me captivated from beginning to end. A game I was sorry to finish. Command & Conquer:Red Alert – 1996 – PC – Classic strategy game. More came with better graphics but none were as much fun. Battlefield 3 – 2011 – Xbox 360 – It was a close run things but this was my favourite Battlefield and moved the FPS genre forward. It brought massive destruction to environments, there was no where safe on the map really and the vehicles were great. Battlefield 1942 back in the day was great but this was the best version of Battlefield for me. Project Gotham Racing 2 – 2003 – Xbox – The best online racer on consoles at the time. Despite the 30 fps and the dullish palette this is still my favourite online racer. Myself and David getting top 50 times in a Paris track is still a standout moment. At around 2 hours of gameplay many will dismiss Monument Valley but they are fools. FOOLS! This is a 10 level puzzle game that is more akin to a living M.C. Escher image than a game. The premise is simple – guide Ida to the end of the level by sliding and rotating elements of the level to allow her to complete the path. It looks and sounds stunning and is such a satisfying fun game. In many ways the length is perfect as repetition is removed unlike so many games that are longer just because they can be, not for any good reason. If it still sounds too short and the screen above doesn’t convince you, the developer has announced this week that more levels are coming. There are no excuses left – just buy it. A PC favourite, FTL is a real time strategy game based on your spaceship. Maybe more a resource management game but you take part in a variety of quests, battles and make choices throughout the game with the aim to save the galaxy with you in charge of your spaceship. It’s tough, especially as when you die you start from the beginning again. Works so well on the iPad benefiting greatly from the retina screen and the touch controls. This is really addictive and each play through is unique adding to it’s shelf life. You can also take charge of different spaceships, again extending the game. Out of all the games on this post, I’d buy this one. Love it. 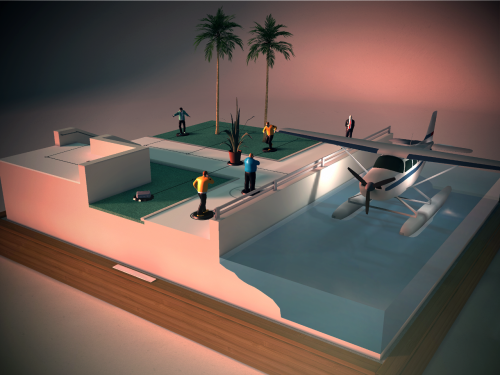 I had zero expectations for Hitman Go, expecting an arcade game or first person shooter but what Square Enix has released is a great looking turn based strategy. You control your agent, dictating which path he takes through a level solving various puzzles as you go. The game is a looker and can be viewed from any angle and it’s great to see some of the big game developers developing unique mobile games rather than rushing out a crappy port. One note of caution is that there is an element of in app purchasing for hints and unlocks but they aren’t needed to play the game and it doesn’t get in the way when I’m playing. An impressive game which will take some time to complete. Hearthstone is a card collecting 1 vs 1 battle game. Collect cards and play friends or strangers in a number of different game modes. Presentation is fantastic and it’s a very addictive game. There is in app purchasing but it doesn’t blight the game and to be honest I’ve not needed to spend any money on the game. Excellent game and you can play against PC p;ayers too. Final game worth trying is Dungeon Quest. 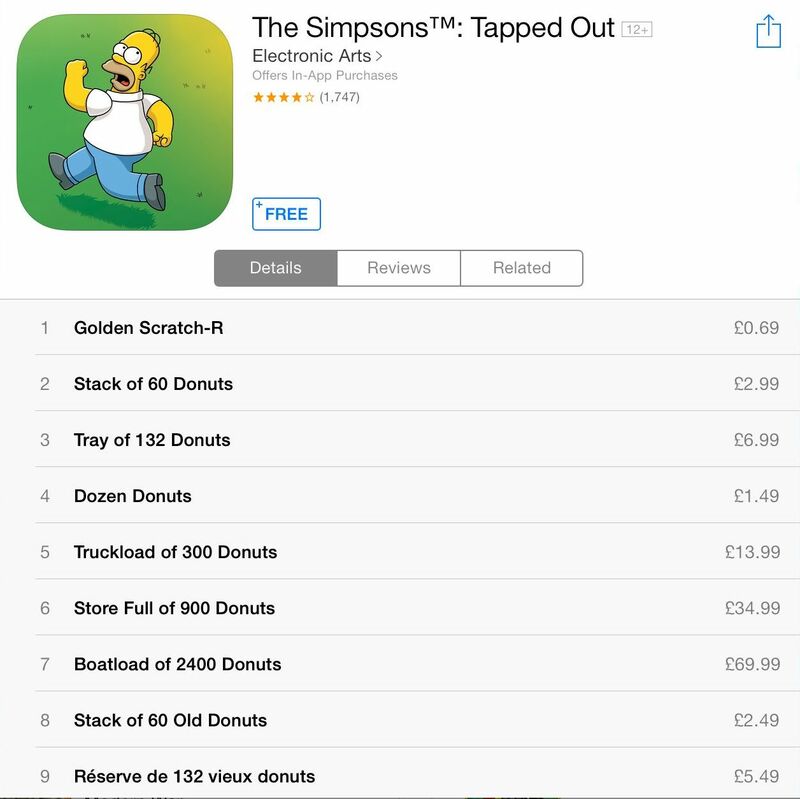 Don’t let the free and IAP tag put you off. This is a great little Diablo lite dungeon crawler that supports various classes and plays really well. Great for blasting through a few levels if you’ve got 20 mins to spare. Hopefully there’s something in that list to tempt you and after months of meh, it’s a great time to game again on iOS. 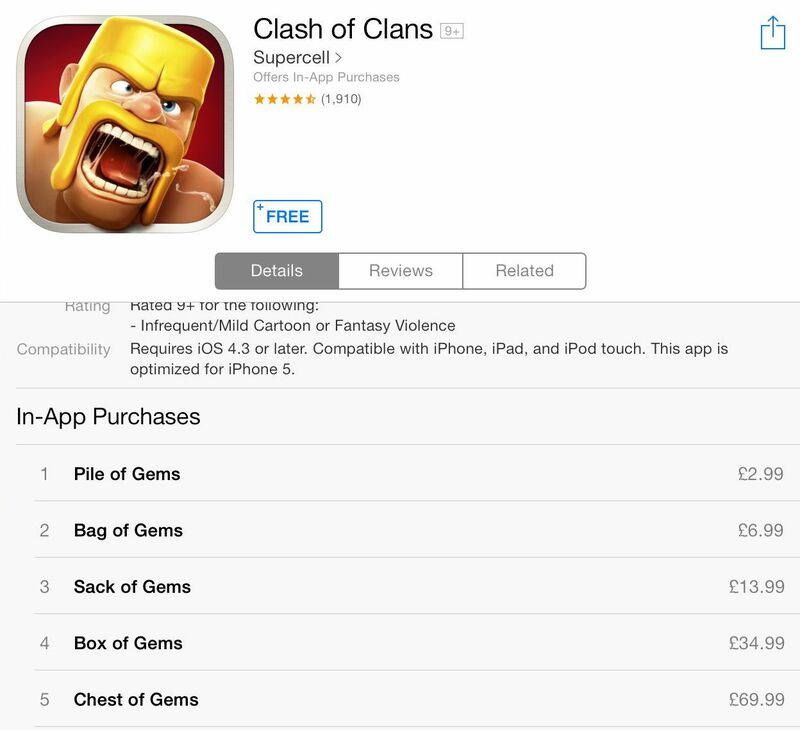 Great post from Thomas Baekdal that has gained a lot of attention on Twitter and other blogs on In-App Purchasing and how it has destroyed, not just destroying, gaming. 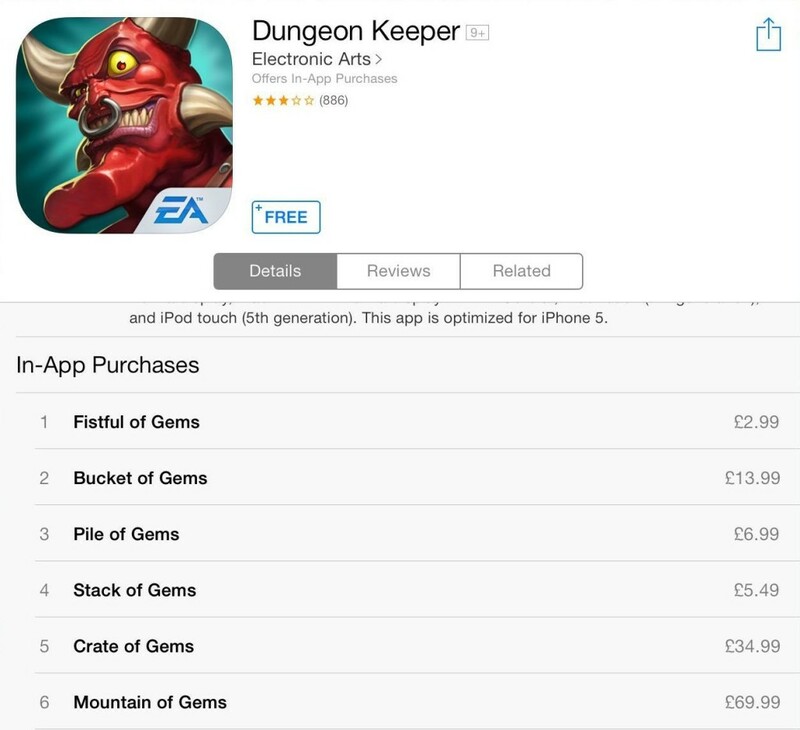 Many have focussed on the fact it has ruined iOS as a gaming platform. Looking at the top grossing app’s today it’s galling to see just how large some of the IAP options cost. The screens above are from just a few of the top grossing games on the iPad. The amounts are horrific when you consider a PS4 or Xbox One full price game is around £49.99. Hard to see how this will change though. 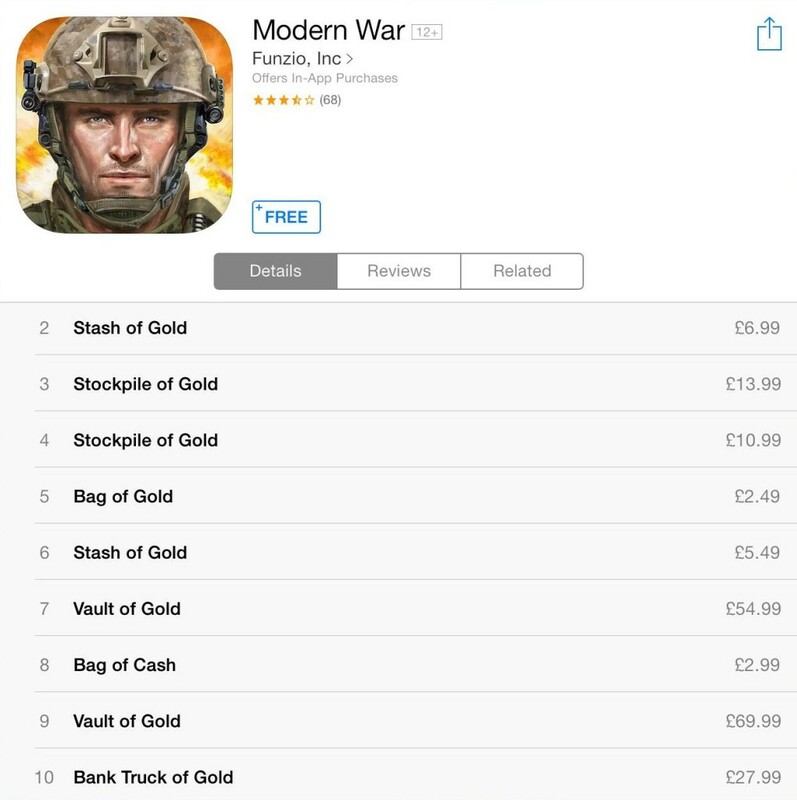 I don’t buy into the freemium games model and refuse to start a game that relies on IAP as a way to play. I’m sure many gamers are the same but it looks like the majority of casual gamers see it as a legitimate way to play. What’s worse is the creep of IAP into full price gaming. Forza 5 for example has some shocking IAP’s for a full price game. I don’t think gaming on iOS or Android is finished, rather there’s a need for Apple and Google to make a stand against some of the ridiculous IAP offerings that developers are allowed to make. I also think the industry as a whole should be marking down these titles – use the app store reviews to mark these titles as 1 star, game review sites should be warning people accordingly too. Ultimately though it’s only by not handing over cash so readily that we will see a reverse in this trend. Wake up people.